Novis is out today! Happy Novel Birthday to me! Today’s the day! Calloo callay. My latest novel Novis is out today! 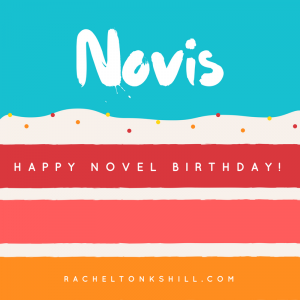 Novis is out today, and I’m so excited! I am so excited to finally be able to share this book with you guys it’s unreal. This is definitely the best book I’ve written so far and it’s probably the most fun I’ve ever had writing a story. If you’ve not read the first chapter yet, you can do so here. If you want to go straight ahead and buy a copy, you can do so at the links below. Novis is basically Beowulf in space but with a diverse cast of kickass mercenaries. The book follows Ros Lamarr and the Erebus Station Irregulars as they take in the curse of Novis colony and fight to take down the beasties that are giving it trouble. It’s got love and loss and friendship and found family. It’s got a sixty year old Russian sniper with a disturbing proclivity for killing men. It’s got a big ginger Scotsman with a cannon for an arm. It’s got a big badass lady mercenary who loves nothing more that wearing pretty floral dresses in her downtime. I wrote this book to be everything I ever wanted from a novel, and I really want you to enjoy it. Novis Colony has a reputation for being cursed. Something is killing the colonists, and every single mercenary team that has been sent to protect them. Ros Lamarr is the best mercenary captain in the Commonwealth and even she thinks twice about taking the job. But she’s sick of low paid jobs and bored of sitting in a station bar pickling her liver and getting into fights. Breaking the curse on Novis Colony is going to ask more of Ros than any other job she’s ever done but if she can do it the rewards will be bigger than even she can imagine. But she can’t do it alone. Ros is going to need all the help she can get from the colony’s assistant governor, Isobel Devereux, and from Gabby Hernandez, her long-suffering best friend and comrade-in-arms. With the help of these two women, and the support of the rest of her mercenary crew, the Erebus Station Irregulars, Ros might just be able to break the curse, but at what cost? If you like big sci-fi adventures with a lot of heart and fun, then Novis is definitely for you. What are you waiting for? Go buy a copy.